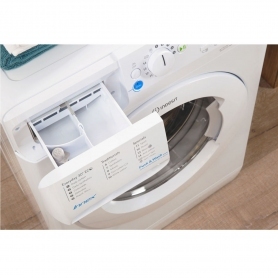 Cleaning your laundry has never been easier with this brilliant Indesit washing machine. With a huge variety of programmes and features, the BWE91484XWUK will help make your life trouble-free. 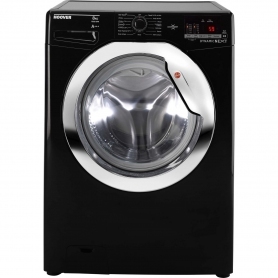 The BWE91484XWUK also features innovative Push & Wash technology. Simply push the button for a 50 minute wash at 30°C. It couldn’t be easier to use. As the Rapid Wash lasts only 30 minutes, you’ll always be able to find time to get your laundry done. Plus, gym-lovers will adore the Sport cycles, specially designed to keep your kit and shoes in the best condition. 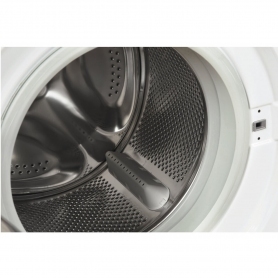 Indesit has even included Water Balance Plus technology with the BWE91484XWUK. By automatically adapting the amount of water needed for each load, you’ll be able to save money and energy. You can also be reassured that your laundry is in good hands with the Woolmark stamp of approval. The Woolmark Apparel Care cycle is created to provide the best care for your woollen clothes. Keep enjoying your cherished items for even longer with this Indesit machine. 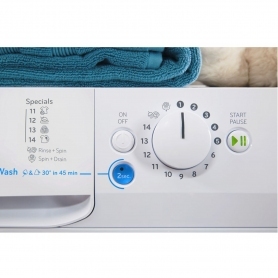 Using your Indesit washing machine is simple with the knob controls and LED display. You’ll even be able to see how much longer your current cycle has remaining. And, the classic white finish makes it a stylish and subtle addition to any home. For added flexibility, you can also delay any cycle for up to nine hours. Combined with a wash and spin performance of ‘A’ rating, you can be sure you’ll be getting the best results for you and your clothes. 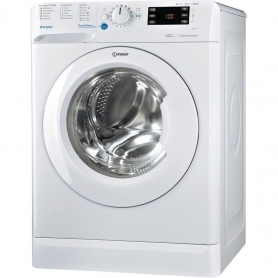 Rated an impressive A+++ for energy usage, this Indesit washing machine is ideal for every home. Order the BWE91484XWUK today.